Presiding over the entrance to Madrid’s University City—where Nationalists and Republicans fiercely fought the Battle for Madrid—is a massive anachronism: a monumental arch commemorating Franco’s victory over the Spanish Republic. Along with the Valley of the Fallen, the memorial outside of Madrid where Franco lies buried, the victory arch symbolizes the dictator’s continued public presence in Spain forty years after the transition to democracy. Yet change is underway. Until a couple of months ago, the broad avenue that Franco’s arch has overlooked since the 1950s was known as the Avenida de la Victoria. Shiny new street signs now say Avenida de la Memoria. And even the Valley of the Fallen may have its days numbered. 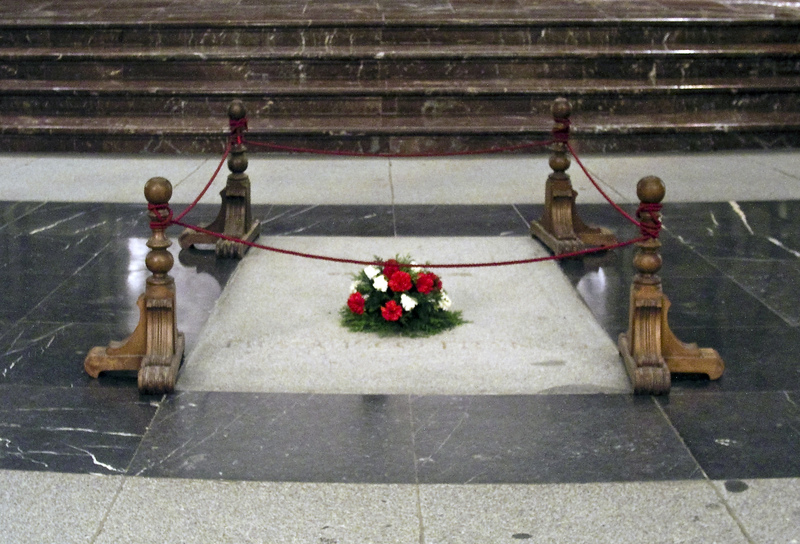 Spain’s new Prime Minister, the Socialist Pedro Sánchez, has decided it’s time to remove the dictator’s body and redefine his mausoleum. Although many in Spain applaud the decision, resistance from the church, some ranks within the military, and the Right has been fierce. In fact, disinterring the dictator was a key recommendation of a blue-ribbon commission, appointed by former Prime Minister José Luis Rodríguez Zapatero in 2011, just before the Socialist government collapsed. The following seven years of conservative rule meant that the report never left the drawer it was tossed in. But Pedro Sánchez, the new prime minister, has vowed not just to uphold the 2007 Historical Memory Law that was adopted under Zapatero but to take it several steps further. This also means tackling the thorny question of the Valley. In July I spoke with the anthropologist Francisco Ferrándiz, who was a member of the commission and is an international expert on mass grave exhumations after violent conflicts. Can you tell me about the commission’s work? The Law of Historical Memory from 2007 actually mentions the Valley of the Fallen explicitly. It states several things: that the site will remain a place of worship and a public cemetery, and that any political activity inside of the monument is forbidden. But it also calls for measures to democratize the site. Still, the Zapatero government took a long time to appoint a commission to deal with the Valley. We weren’t convened until May 2011. Our first measure, by consensus, was not to turn in our report during the elections period, not to use it as an electoral tool. In fact, we turned it in after the socialist electoral defeat. Once the PP came to power, it automatically tossed it in the trash. We had divided into three subcommittees. My group dealt with the crypts of the site, the burials, and the issue of Franco’s exhumation. In fact, a big part of that part of the report is mine. 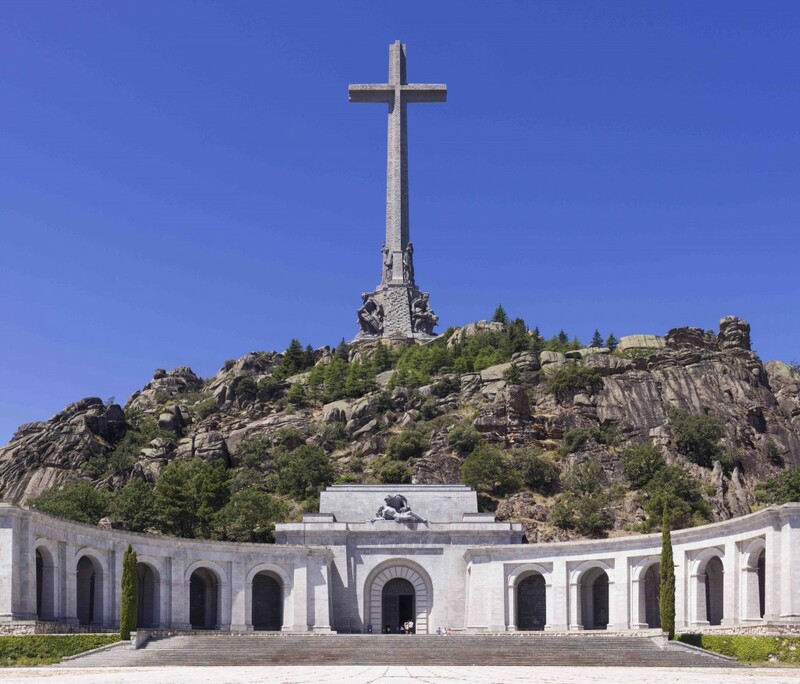 We mention how Franco himself, in his decree for the foundation of the monument and its inauguration, conceived the Valley of the Fallen as a site for war victims (“fallen” victims). Therefore, it was not his will to bury anybody not directly linked to war casualties. We are not very sure how Franco ended up buried there. It seems that it was a decision made by Carlos Arias Navarro. There was a formal state funeral and a royal mandate so that the Benedict Order would bury the body of Franco. Now a mandate like that is very hard to overturn; it touches on the core of political legitimacy in Spain. We are not very sure how Franco ended up buried there. However, what we advocate for in our report goes beyond Franco’s exhumation itself. We underscore the need to re-signify the monument, to make it become something else. In order to achieve that, we argue, the Francoist hierarchy of the site needs to be dismantled. That implies not only removing Franco. It also involves José Antonio Primo de Rivera, the founder of the Falange party, who lays alongside Franco. We need to remember that Primo de Rivera has always presided on all the plaques commemorating all the “Fallen for God and Spain” all over the country. José Antonio could not continue to have an honorary burial place in the Valley of the Fallen. That is when we decided to draw a red line. Franco needed to leave the Valley because he did not even belong there according to his own concept. He was not a victim of war. But José Antonio Primo de Rivera, could no longer stay next to Franco either. Everybody is talking these days about Franco’s remains being removed. But in fact what we proposed was a double move: Franco should go out, but Primo de Rivera should go to a side crypt with the thousands of other victims of war. Probably, Primo de Rivera’s family will not agree and will take him out, but all that would be part of the negotiation. Once Franco is out of his grave, where will he go? What is the next step? I do not have firsthand information as of now, but the logic that is being followed is the one that we, the commission of experts, decided on. The three most conservative members from the commission of experts actually rejected Franco’s exhumation. Regarding Primo de Rivera’s body, nobody objected to the decision of moving him to a side crypt; nobody really cares about his fate, not even the political right. The right wing really cares about Franco, not José Antonio. Now, where Franco’s body would go depends on the family. One logical decision would be that he be buried next to his wife, Carmen Polo de Franco. She is buried in a crypt that was originally built for the Franco family in the Mingorrubio cemetery, in El Pardo. It is the same cemetery that holds the remains of Carrero Blanco and other Francoist leaders. How would this go? It would be very easy from a technical point of view. The problems are mainly of a bureaucratic, symbolic, and legal nature. About a year ago, the socialist party presented a non-binding motion to revitalize the Law of Historical Memory, asking that the body of former Spanish dictator Francisco Franco be removed. It was passed by Congress by absolute majority. The only parties that abstained were Partido Popular and Esquerra Republicana [the Catalan Republican Left, for whom the motion did not go far enough —the editors]. This motion had no legal force because the government was conservative. But it was of great political significance. The new sudden switch in government has changed this. The new juridical apparatus must now carefully analyze all the new possible implications of the motion. It needs to be done with extreme care and in a way that will prove irreversible. The new government could also make now a decree by which they demand the exhumation of Franco and the handing of the remains to his family. But the family disagrees. Some of its resistance is tactical: an effort to protect the many privileges it still enjoys, including a duchy, Franco’s summer residence in Galicia, and the Franco Foundation. In any case, I think the state should put on the table two options: either the family handles the exhumation through a funerary service of their choice that hires public officials if they wish. (This is what happened recently when the remains of generals Sanjurjo and Mola were exhumed.) Or they let the state handle the exhumation and they decide what to do with the body. I think there would not even be the need for a forensic doctor, because Franco’s body was embalmed, so we would know it is him. How do you think the media has handled the issue of the exhumation of Franco? There has been definitely some sensationalism. In fact, our Valley of the Fallen report contains a lot of interesting elements, but the only thing that made the headlines was that the commission of experts recommended the exhumation of Franco. All the newspapers, even the international ones, published that. 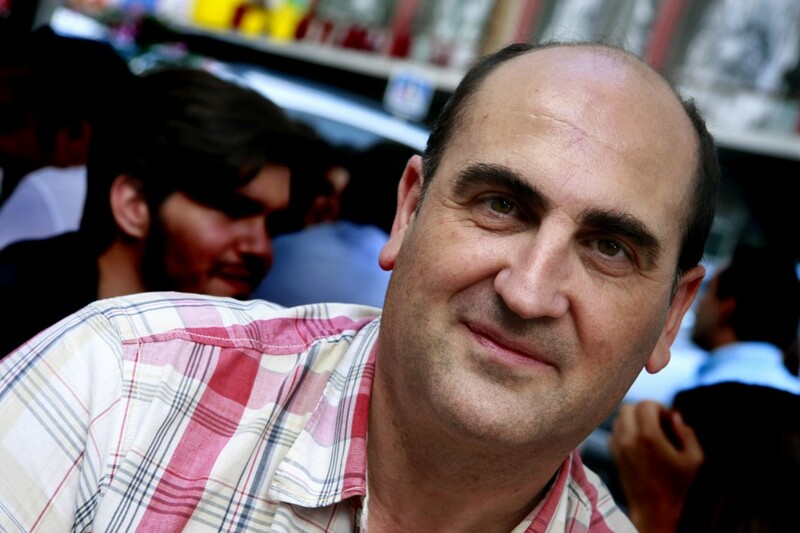 Exhuming of Franco and moving José Antonio is necessary but by no means enough. There are many other things that need to be done in order to convert the site into something worthy of a democratic society. Exhuming of Franco and moving José Antonio is necessary but by no means enough. One of the things I proposed is that the site become a monument of interpretation, with the latest technologies (very powerful Wi-Fi, virtual guides, downloadable files and pictures, etc.). As such, it could become part of some sort of itinerary of European totalitarianisms, together with Germany, Russia, and Italy, where you could visit totalitarian monuments like the Nuremberg Stadium, the Munich Stadium, the leftovers of the Germania project by Speer and Hitler, the Stalin skyscrapers… This was originally an idea of a childhood friend of mine, the architect Alejandro Zaera. It would show us how a totalitarian ideology literally petrifies itself, turns itself into stone. But right now, this idea cannot be realized because the Law of Historical Memory stipulates that the Valley continue to serve as a place of worship. In other words, it cannot be desacralized. Currently, the crypts fall under the jurisdiction of the Benedictine monks. In our report we proposed that the place become a special public cemetery, with a state jurisdiction. This is crucial, but the mass media has never ever paid any attention to it. What about the vast amount of unidentified bodies in the crypts? Do you think it would be an impossible task to identify them? It is very complicated. There are 28 levels of burials. There are three levels of burials on each of the sides of the transept, behind the chapels dedicated to the Virgin Mary. Some have 3,000 bodies, others have 6,000, some do not have any… But in the transept itself, in the chapel dedicated to the Blessed Sacrament and the Holy Sepulcher, there are five levels. In 2010, a forensic doctor from the Ministry of Justice issued a report regarding the state of the crypts. It was very superficial. They were able to get some cameras inside and take pictures, but they were considered top secret. I had to really push so that our commission could see the pictures. A lady from the Ministry of Justice came one day with a pen drive and kind of reluctantly showed them to us. They showed very disorganized crypts, with cluttered bones. Right after that, she put the pen drive in her pocket and left. Somehow, I do not know how, those same pictures were leaked, and arrived to Cadena Ser a year ago, who published them. Many families were not happy with that report. But a more recent report included images from a crypt in which you can see wooden and bulging boxes next to a wall and on top of each other. In some of them, the name of origin can be read in white paint. In other words, things may not be as chaotic inside as we thought. Regarding the dead people inside of the Valley, there is a book of names, guarded by the Benedict Order, which states where each box is located. The list has the names of about 20,000 people, but there are over 12,000 unidentified bodies, who mainly come from military cemeteries. There are republicans among them, but it is unknown exactly how many. The Valley was inaugurated on April 1, 1959, in commemoration of the day of the victory of the war. That was the year that, for the first time, bodies were transferred to the site. José Antonio Primo de Rivera arrived a few days before, who, by the way, had been initially buried in the Royal Pantheon of El Escorial, in 1939. The Falangists actually hated that his body was taken from there. They considered it a degradation to go the Valley. He eventually was transported by shoulder from El Escorial to El Valle. If the Francoists knew about the conditions in which the crypts are now, they would be horrified. What should be done next is an assessment of every single crypt and level of burials, to give us an exact idea of the state of the crypts. If the Francoists knew about the conditions in which the crypts are now, they would be horrified. Let’s not forget that many Franco followers donated their dead to this project. And they may very well be mixed up with Republicans now. It is a tremendously complex issue; it is one of the most complex forensic issues in the world right now, comparable to the identification of bones found at Ground Zero in New York City, or at Srebrenica. When do you think Franco is actually going to come out? Everything surrounding the Valley is always very secretive. Whenever it is, it needs to be done as soon as possible. There are some municipal mortuary sanitation laws from the Sanitation Department that need to be followed. It seems that these mortuary laws object to performing exhumations during the summer because the heat might damage the body. Another obstacle. But we have to make sure that, when the exhumation finally takes place, all these judicial hurdles have been patiently taken care of, until there is not a single impediment any more. The Sunday right after this interview, hundreds of people protested at the Valley against the removal of Franco’s remains from the site. Demonstrators hailed the dictator, making the fascist salute, chanting his name, and waving flags with Francoist symbols. What is seen by many in Spain and the world as a long awaited and naturally democratic move, is considered almost heresy by his many faithful followers.